I finally bought an Elite Dangerous HOTAS and I might dare to call it my best hardware purchase of the year. I’m by no means an expert when it comes to Elite Dangerous. In fact, with a grand total of 10 hours of game time before writing this post, it’s fair to say I’m pretty fresh when it comes to ED. Nine of those 10 hours were spent struggling with the controls in some way or another. I started with a mouse and keyboard (“How hard could it be?”) then graduated (forcibly) to using a Bluetooth gamepad; this got me closer, but I gave up in frustration before long. More than a year on, one of my friends finally convinced me to splash out on an Elite Dangerous HOTAS. “HOTAS” is an acronym for “Hands On Throttle-And-Stick” and really makes you feel like you’re in the cockpit. It’s a little intimidating, but I found within minutes of using it that I was in for a smoother ride – literally – this time around. I’ve joined the legion of gamers that have purchased a HOTAS for the sole reason of playing ED. There’s pretty much one go-to model: Thrustmaster T-Flight Hotas X Flight Stick . My previous reference to “splashing out” was a bit of an overstatement; the Thrustmaster is a steal and comes very highly rated. The top five HOTAS setups on Amazon are shown below. With the number of buttons and axes available in a HOTAS, combined with the complexity of controls in ED, configuration can seem an insurmountable challenge, especially if you just want an easy way to play the game (like me). Luckily, many others have already figured it out. You can find a vast number of “bindings” files pre-configured – just Google something sensible. I went with a this bindings file and performed the edits below. The edited version is available here. Note that I didn’t configure this bindings file; it was something I picked up from the official Frontier Forums and have stored for posterity. 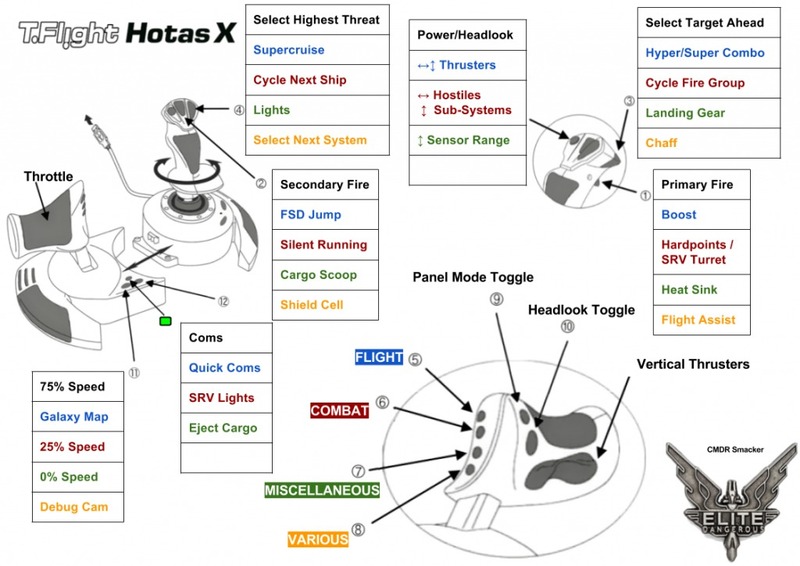 Elite Dangerous HOTAS – Bindings diagram for linked .binds file. Google diagram available here. Note that I actually have Elite Dangerous: Horizons , for which the linked file was created, but I don’t imagine there’s too much difference between bindings compared to the base game. Download the bindings file (either the original or my edited version). The file will have the extension .binds. Copy the bindings file to C:\Users\<Username>\AppData\Local\Frontier Developments\Elite Dangerous\Options\Bindings. Rename the bindings file so that the version 1.8 in the name is changed to 2.0. Make sure to select the TMHotasXModsSM preset in the in-game Controls menu. Use one of the rear USB ports in your computer; the front one probably won’t work. Make sure the “Home” button on the front of the HOTAS is green by pressing it. If it’s still not working, download and install the latest drivers from the Thrustmaster website. This should be all you need to do. 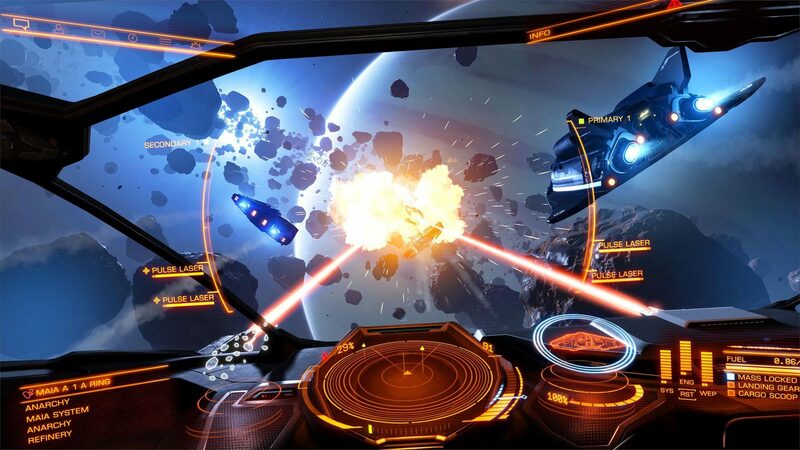 There is still some learning to do when it comes to using the Elite Dangerous HOTAS. There are so many ways to control your spacecraft in ED that it would be silly to think otherwise. The advantage is that pretty much everything is at your fingertips thanks to the ergonomic design of the system. The training missions will give advice according to the new bindings so it will tell you which actual buttons to press; you won’t have to be constantly referring to the controls menu. What does take a little getting used to is button combinations. There are four buttons within reach of your left thumb (on the “throttle”) which can be held before pressing some other button with your right hand (on the “stick”) to perform an action. Thinking about the buttons on the throttle as a modifier (in a similar way to CTRL, ALT, or SHIFT on a keyboard) can help you get used to these combinations. Indeed, with a couple of hours of practice, the bindings for the HOTAS were sticking with me in a way that the mouse and keyboard or gamepad weren’t. quick power redistribution between system, engine, and weapons. This latter function in particular really struck me. There is a lot of power in being able to balance your subsystems in the middle of a dogfight, but this wasn’t really feasible with the other control methods. The HOTAS lets you do it, and let me tell you: it’s brilliant. I wish I’d got one of these sooner. If I had, I might not have shelved ED so quickly the first time. Just do yourself a favour and get one! Have you got a favourite HOTAS? A particular bindings file? Some other way of playing Elite Dangerous? Let me know in the comments or on Twitter. If you want notifications for more simulation game related articles, consider subscribing to Odin Gaming. Hi, I followed your instructions directly and I see the preset listed in the in-game presets list, but when I select it, none of the joystick controls work. The default Thrustmaster Hotas X setting works fine, so I know it is not a hardware issue. I would still like to use your bindings file if possible. I made sure the version number in the file was changed to "2" and "0" as instructed. Please advise. Follow all of the HOTAS Installation Debug steps listed in the post above. Make sure you don't have any other game controllers plugged in or active on your PC. This includes any gamepads or other joysticks you might have (but not mouse and keyboard). You might need to restart your computer so that the HOTAS is recognised as the default game controller. I've seen some reports that the Home button on the HOTAS has been red rather than green when it finally got round to working. Try toggling this to see if it makes a difference. Try toggling it both when you're in-game and before you launch the game. After activating the TMHotasXModsSM, try making a trivial change to the control setup so that it becomes a custom bindings file. Change it back. Use the custom bindings file rather than the TMHotasXModsSM one. I'm sorry there doesn't seem to be an obvious solution to this! Please let me know if any of the above suggestions fix the problem for you; I'd be happy to add it to the article. I love your setup it is FANTASTIC, however when I’m in the galaxy map and I move I can’t select amy systems. Help please! Thank you very much for this post and bindings. Im now playing ED again and thinking about an Hotas. Just seen a second hand set fo 20 euro and I think i´m going for it. You're very welcome! I hope it works out for you! This might help people that is having problems with the T.Flight H.O.T.A.S 4. You need to open the binding file and replace all the lines that say “ThrustMasterTFlightHOTASX” with “ThrustMasterHOTAS4” You can do it real easy with WordPad and the replace function. Hey, I’ve stumbled over your post that pointed to this while looking for some help with setting up my Hotas. I’ve just got my Oculus Rift and I’ve actually never planned to get Elite Dangerous right now, but hey, the CE was on sale for only 15 Euros, so… And then I’ve decided to go full in right from the start and get me a Hotas. Your config file (and the diagram of the key settings you’ve kindly posted along with it) were immensely helpful, those settings are just great. Especially the way the assignment of multiple functions for the keys works great; I’ve only needed a couple of training flights in 2D to get along with this and memorise most of it. This helped a lot to jump right in! The only thing I have changed is that I’ve switched the axes for Rolling and Sheering, the way this was set just felt unnatural to me. I’ve used to play Wing Commander a lot with a MS Sidewinder and my version of those settings and it seems, that specific muscle memory is still there… Anyway, thanks again and greetings from Germany! Thanks so much for your feedback! I'm really glad you found the information useful. It's true - a good setup like this with a HOTAS makes it much easier to play the game and immerse oneself in it. Hey, I am just saying how it is. One remark though, maybe as something to keep in mind for later. I am experimenting with voice attack at the moment and trying to figure out which key to use for the "voice command" button - I am not exactly sure if I can use one of the function key for that and how to do it. As I understand, the buttons on the back of the throttle, especially Nr. 10 (Headlook Toggle) are not used in VR anyway, so I guess one could use those? Thank you so much for this!!! I tried the standard one and it didn’t have vertical thrusters working. Went for yours and everything just worked ? You're welcome! I'm so glad it helped you! Hi, I just installed your binding file, but somehow it’s messed up my controls. I checked in the options why this might be and apparently Elite Dangerous recognises the press of button 5 as button 9, the press of button 9 as button 2 and the press of button 2 as button 5. I have no clue why and how this could be fixed. Please advise. No idea what this could be? Hey, could you please update the keybinding file to 3.0 ? I followed the directions on point. Made sure I have the latest drivers. But I'm still having an issue where the power distribution down and trigger buttons are swapped. Any help? No problems setting up the HOTAS with your bindings file, everything works great and I’ve even made some modifications to the bindings, no issues. The very first thing that had to change was the mapping for ‘Silent Running’ That button is just used far to frequently in Combat I found myself turning on silent running during combat by accident. As you can imagine this is not a winning move and often results in a massive fireball of your own ship. Swapping the positions of “Cycle Fire Group” and “Silent Running” got rid of the untimely mistake. I wonder if most of the control mappings I’ve seen set it up that way to make newbies easier to kill. ? This worked well for me recently. However, during a mining training exercise it said I had to enable analysis mode and I was unable to do that with these keys. I think perhaps it was unbound. Maybe I was just being an idiot somehow but anyway, what I did to fix it was go to Mode Switches –> Enable HUD Mode. I set it as the SHARE key on the ps4 (75% speed button in your controls.) Then I went and unbound the SHARE key in the options menu as 75% speed. Now whenever I press that button it will enter either analysis or combat mode. Thanks a lot for the work here. Made it (RELATIVELY) simple to get into this. Still pretty confusing at first but seems kinda fun now that I’ve gotten the hang of it. Thanks for the feedback! I'm glad you're getting some use out of the guide and enjoying Elite with a HOTAS - it makes a big difference! Thanks for this…just getting around to setting it up in conjunction with VA….so, how do you return to the “default” mode (in the photo, I guess it would be the black bindings.) I see that you select the buttons 5-8 to get to the Flight, Combat, etc mode but how do you return it to default (black)?